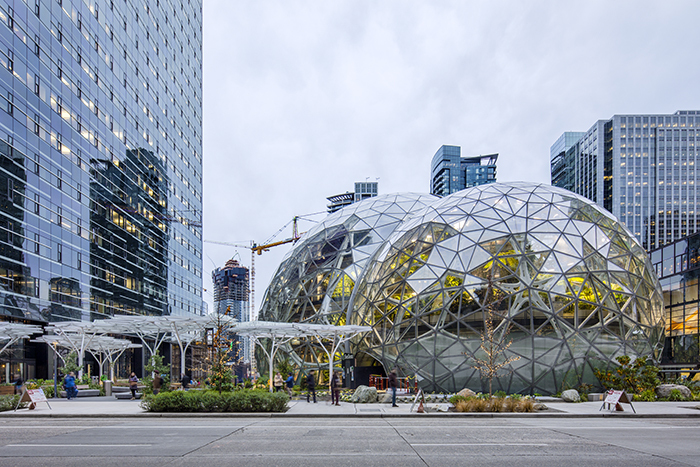 The interior of the Spheres covers 65,000 square feet of space filled with tens of thousands of plants and trees, as well as rope bridges, a waterfall, a creek and a conference room enclosed by greenery, according to the project’s architectural firm, Seattle-based NBBJ. The Spheres create an environment hospitable to both people and plants, the Seattle Weekly News reported. Daytime temperatures inside the Spheres are kept at 68 to 72 degrees with humidity just slightly higher than the Seattle average of 62, while nighttime temperatures drop to 55 degrees with humidity reaching 85 percent. The Spheres are designed to maximize sunlight, minimize heat gain, and achieve Leadership in Energy and Environmental Design (LEED) Gold certification, according to Inhabitat.com, a weblog devoted to the future of design. “The goal is to create a working environment that is more park-like and exciting than a typical ‘vanilla’ office space,” Inhabitat.com shared. 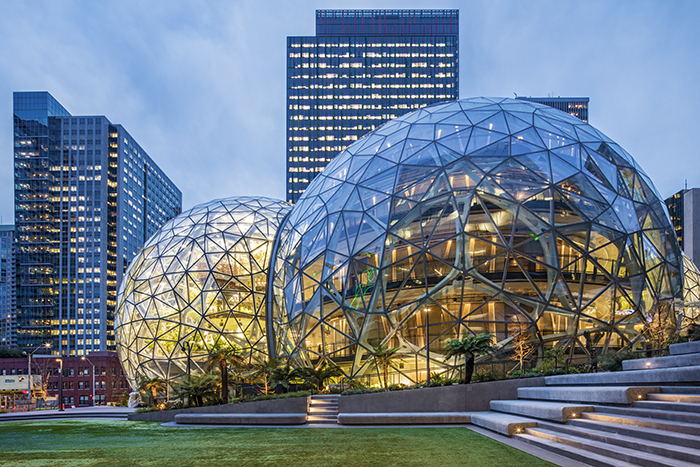 Many of the plants selected for the Spheres came from the cloud forests of Central America and Southeast Asia, which match the environment inside the Spheres, according to the Seattle Times. The fabricator spray-applied a primer coat of Series 90-97 Tneme-Zinc, a zinc-rich aromatic urethane coating over steel that was prepared in accordance with SSPC-SP10/NACE No. 2 Near-White Metal Blast Cleaning. After the steel was shipped to the site and assembled, the field applicator power tool cleaned the weld seams and stripe-coated them with a single-component, zinc-rich aromatic urethane coating containing less than 100 grams per liter of VOCs. Applicators completed the coating system with an intermediate coat of Series 27WB Typoxy, a water-based epoxy with exceptional durability and corrosion resistance, as well as a finish coat of Series 1072V Fluoronar, a low-VOC, fluoropolymer coating with outstanding color and gloss retention. With seating for up to 800 people, space in the Spheres is allocated to employees under a reservation system. Amenities inside the four-story Spheres include a ground-level waterfall, a tank with aquatic plants and animals, a tree house meeting room and 60-foot-high living wall covered by more than 200 plant species.